As I mentioned last month, I'm playing a game with some of my friends. We've been playing for twenty days now, cycled through each player (photographer) twice. It's been a very interesting experience for all of us. 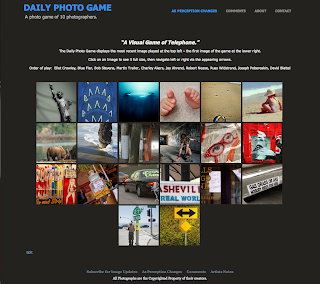 The Daily Photo Game is designed to be inclusive for our audience. The main screen, pictured above, shows thumbnails of the images played. The first game image appears in the lower right corner of the screen and the most recent image played appears in the upper left corner of the screen. We have a Comments section for viewers to leave us notes, we have a blog entitled Artist Notes where we write about our thoughts on individual images (and viewers can comment there as well) and we have a subscription link for those who wish to follow along to click, leave us your e-mail address and you'll be notified as each new image is played. As I play the game, as I see my friends uploading images three or four days before it's my turn, I experience a sort of anxiety as I begin to strategize for my next move. I expect my friends are having similar feelings. One thing is certain, we're all having a blast. We hope you'll join us.